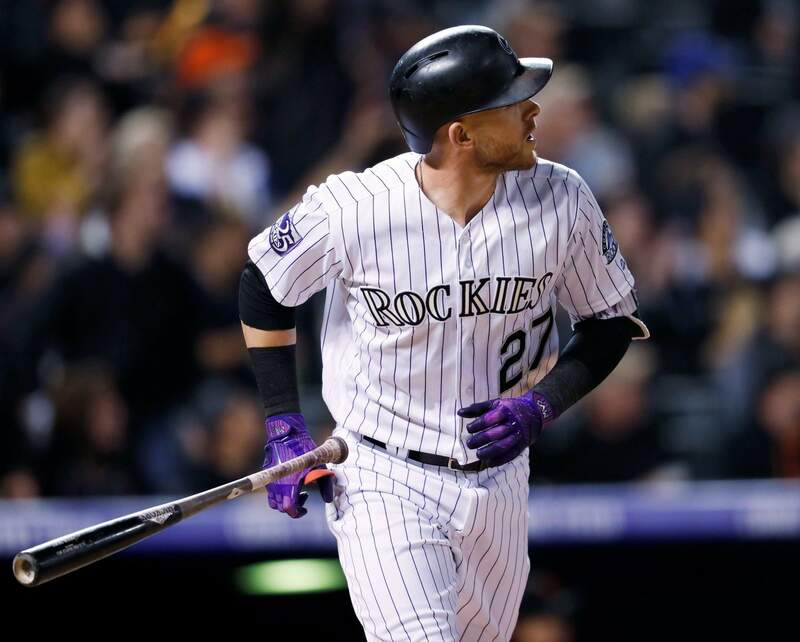 Colorado Rockies’ Trevor Story follows the flight of his solo home run off San Francisco Giants starting pitcher Andrew Suarez in the fourth inning Wednesday in Denver. Colorado Rockies’ Trevor Story follows through on a solo home run off San Francisco Giants starting pitcher Andrew Suarez during the fourth inning Wednesday in Denver. Colorado Rockies’ Trevor Story falls in the batter’s box after connecting for a solo home run off San Francisco Giants starting pitcher Andrew Suarez in the first inning of a game Wednesday in Denver. 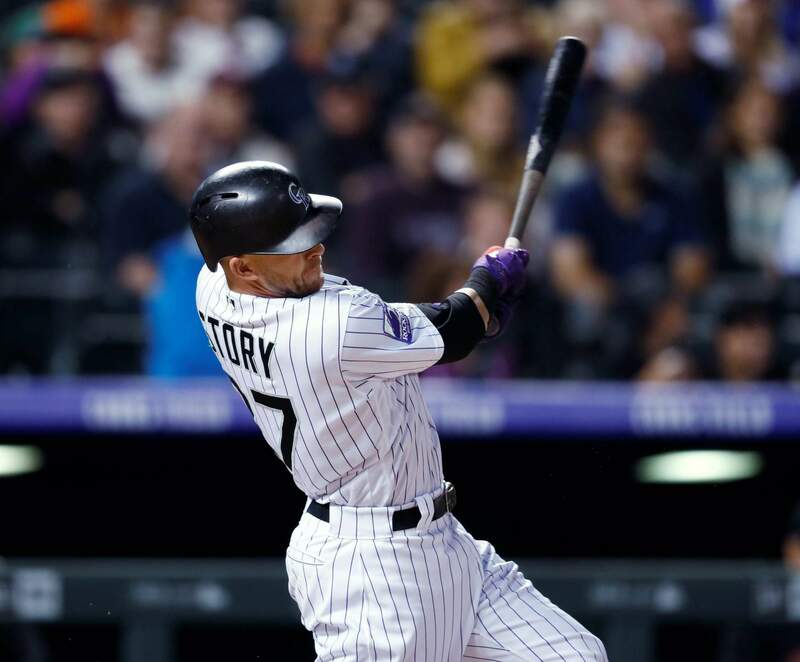 Story’s first home run, a 459-foot shot to left field, according to Statcast, gave the Rockies a 2-1 lead in the first inning. “As soon as it came off the bat I was like, ‘Oh my god, it’s going to hit the scoreboard. It’s going to go straight to my Lamborghini in the parking lot,’” Gonzalez said. Story’s last home run — his 31st of the season — soared a projected 416 feet and gave Colorado a 4-3 lead. He popped out of the dugout for a curtain call as the crowd of 24,790 cheered. Suarez wasn’t unhappy with his outing despite the big night from Story. RAW POWERStory’s first home run had a little twist to it. After he connected, he lost his balance and fell to the ground as the ball landed on the concourse in left field. DANGER AVERTEDRockies outfielder Charlie Blackmon gave his team a scare when he was hit in the helmet on a line drive off the bat of teammate Antonio Senzatela in the third inning. Blackmon was on deck when the ball hit him near the team logo in the front of his helmet. He was looked at by a trainer and Black but was able to stay in the game. Blackmon received a loud ovation when he came to bat. ROAD WOESSan Francisco has struggled away from home lately and at Coors Field all season. The Giants have lost six straight in Denver and nine of their last 11 on the road overall. TRAINER’S ROOMGiants: SS Brandon Crawford was out of the lineup with a sore knee. Bochy said the knee has bothered Crawford recently and with San Francisco having an off day on Thursday, he should be able to return Friday. UP NEXTGiants: LHP Derek Holland (7-8, 3.56 ERA) will get the start when San Francisco opens a three-game series at Milwaukee on Friday. Holland is 2-0 with a 2.42 ERA in his last eight starts.